Discovery Education engages in creating partnerships, both national and global, to bring the best professional development into our classrooms and homes. November is National Epilepsy Month and Discovery has partnered with the Epilepsy Foundation to launch Understanding Epilepsy – a site designed to broaden the understanding of epilepsy and erase stigmas associated with seizure disorders. I spent about an hour, maybe less, previewing the materials, and was impressed with this new partnership at DE. I think you will be as well. • Videos featuring teens who speak out about living with epilepsy. Discovery has a SPECIAL OFFER! Be one of the first 50 teachers or school personnel to send us your feedback regarding the Epilepsy Foundation’s materials and you’ll receive a free Discovery Education DVD. 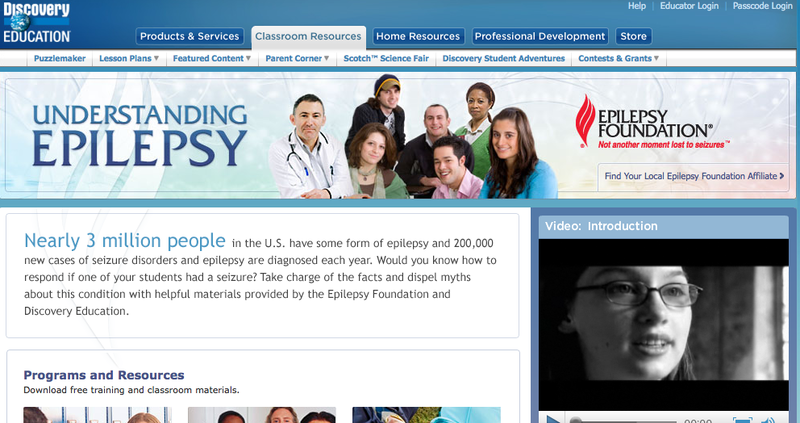 Visit www.discoveryeducation.com/epilepsy to learn more. Click here to provide feedback. Teens who register on GoEYC.org can receive a free laptop skin! Learn more here.